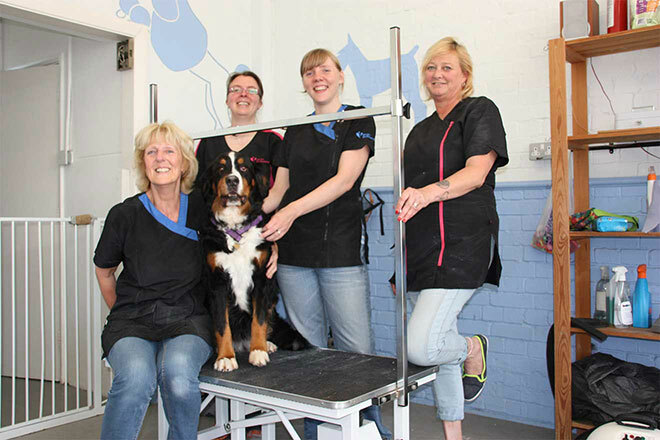 Annie’s Dogs is a dog grooming parlour located in Corsham, Wiltshire. With a real passion for dogs and grooming we provide your dog with a quality service from qualified groomers. You leave your dog with us for about 2 hours (no dog is kept waiting). Your dog will be groomed from beginning to end by one groomer who is with your dog throughout. She will discuss with you exactly how you would like your dog cut i.e. maybe in the winter a thicker body coat left but the underbelly and legs shorter for muddy walks! Any problem areas efficiently sorted. Clipped or hand stripped (whichever is appropriate for the coat) or just trimmed or brushed. Your dog is then bathed using a sensitive shampoo (an excellent flea shampoo used if necessary), fluff dried with a dryer and by hand (not in a cabinet dryer), ears are cleaned, nails are cut and then a final trim and check over before being collected by their delighted owner! The full groom is recommended 6-8 weekly as a guideline. Any instructions from vets or owners welcomed and strictly adhered to. Old, nervous or frightened dogs are all taken into kind consideration and no dog is ever made to endure anything beyond it’s capability. You know how good you feel when you shower and wash your hair, well the dogs feel it too………revitalised! This is especially so when they are moulting as it will help them shed their old coat. Also, our professional grooming far exceeds the odd wash with the garden hosepipe or a dip in the river. You can always call in for nail cutting, feet trimming or any small job that just takes a little time and you can stay with your dog for this. If, like us, you would be worried for your elderly or frail dogs, you can stay with them and instruct us as we go along as to what your dog is happy with….if it’s too much …we will stop …. we can take care of the difficult areas which you cannot manage at home. Nothing is too much trouble for us and we ourselves have all had old dogs so please do not worry. Also do not be embarrassed by smelly or mucky areas that you have found impossible to cope with. Puppies are great learners and eager to please so the sooner they are gently introduced to new experiences the easier they will take to them without fear. We invite you and your puppy to come for a 1/2 hour appointment costing £12 at which we will trim nails, feet and around eyes and face etc…..at the same time you are welcome to ask advice while we show you our techniques enabling you to copy this at home and build up your puppy’s confidence in being handled in tricky areas! This service is a pleasure to us and invaluable to most new owners and puppies and it certainly pays off in the years to come. Dogs,obviously, grow a winter coat. This needs thinking about if they live in a heated environment. They cannot take their coats off like us when entering our warm homes. Sometimes overheating can bring on skin and coat problems amongst other things. Most dogs spend a few hours at most outside in the winter and the rest of the time in a centrally heated house! Check if they are searching for cool places to lie (kitchen floor?) or panting, itching or chewing themselves or drinking lots. We advise for dogs to have their normal grooming or clipping take place with us in the winter months but maybe choose for the body to be left slightly longer than normal (we can cut at any length ) If you are worried about them being cold on their walks, especially the older dogs, there are some brilliant dog coats on the market that are warm, waterproof, lightweight, flexible and DON’T LOOK SILLY!. Regardless of the weather every dog needs their nails, feet, ears and eyes etc. sorting out. Their skin and coats still need constant care and to have all the dust and mites, smoke and cooking fumes from the house or mud from their walks kept under control by a good bath and brush. Feet in particular cause a few problems if they are very hairy and always wet. Mud and matted hair if left will harden forming “stones” in between pads and toes. In the event of snow ……well ….we’ve all smiled at the dogs in their ‘snow shoes’……but they simply cannot walk!. Pop in and have nails cut for £6 or feet trimmed for £6 or both done for £10. All our groomers love working with your dogs and would love to say that missed appointments don’t matter but their livelyhoods depend on all appointments. We understand that things come up and appointments need to be changed, we just ask that you please call us to cancel the appointment instead of just not turning up. Please be courteous enough to ring us to cancel appoinments. We regrettably need to enforce a ‘Full Charge’ policy for any missed appointments. This does not apply to appointments cancelled at least 2 hours before.